Your child can make her own starry night pictures by following these printable craft instructions. Use a white crayon to draw a night scene, apply black or blue watercolor paint, and the images will magically appear. Add some star stickers and you have a starry night picture worthy of a spot on the art wall. 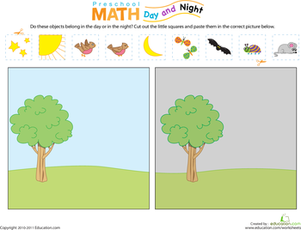 Not only does this activity provide wonderful opportunities for creativity, but you and your child will have the chance to discuss the differences between nighttime and daytime. Looking for More hands-on craftsWith a starry night theme? See our activity pages for constellations of ideas. Silent night, holy night, all is calm, all is bright! This printable displays the first two lines of the classic Christmas carol over a pretty background. Oh holy night, the stars are brightly shining! Print out this pretty design featuring the lyrics to the Christmas carol "Oh Holy Night." 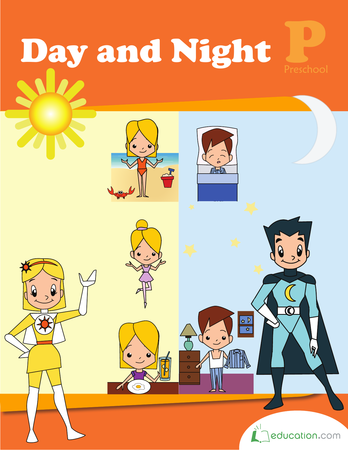 Explore the differences between day and night with Daisy and Norman. Your child's observation and fine motor skills will be put to the test by all of the sorting, sequencing, and simple experiments. Does your curious preschooler know what objects belong in the day and in the night? Let her sort owls, stars, and rainbows daytime or nighttime scenes. Think your little one knows what sets the night apart from the day? Put his knowledge to the test with this cut and paste categorization worksheet. No matter what the season, preschoolers will love to learn to count with this fun, easy "Addition with Pictures" worksheet featuring fall leaves. This worksheet helps your preschooler learn the beginning sounds of words as she matches them up with corresponding cute pictures. 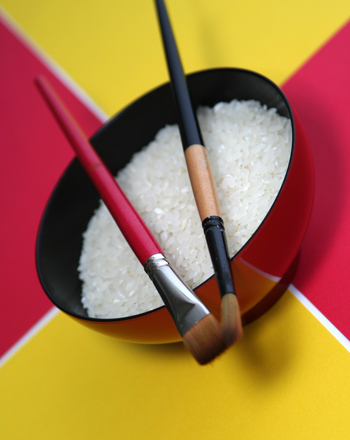 Use rice to make pictures. Is your child starry-eyed about patterns? Help him practise making an AB pattern of stars with this dazzling worksheet. This print features lyrics from the Christmas carol over a starry holiday background.